Massy traded for the second day at 52 weeks’ low. Trading on the Trinidad & Tobago Stock Exchange closed on Thursday with Massy Holdings ending at another 52 week’s low following another one on Wednesday. Market activities ended with 11 securities trading against 12 on Wednesday, with 3 advancing, 2 declining and 6 remaining unchanged. At the close 769,673 units valued at $3,207,315 compared to 57,944 units valued at $1,115,191, changing hands on Wednesday. The Composite Index fell 0.34 points to 1,229.79. 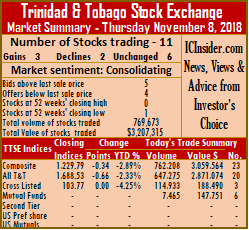 The All T&T Index lost 0.66 points to end at 1,688.53, while the Cross Listed Index closed unchanged at 103.77. Stocks to Watch include, a number of companies that are exhibiting bullish tendencies and may be moving higher in the days ahead, the group includes, NCB Financial, Republic Holdings, and West Indian Tobacco. Stocks closing with gains| Clico Investments closed with a gain of 14 cents and ended at $20.15, with 6,850 stock units changing hands, Trinidad & Tobago NGL gained 1 cent and settled at $29.50, after exchanging 9,275 shares and Trinidad Cement added 5 cents and concluded trading at $2.65, after exchanging 620,133 shares. Stocks closing with losses| Massy Holdings closed with a loss of $1 to closed at a 52 weeks’ low of $44, after exchanging 2,300 shares and Point Lisas share fell 1 cent and ended at $3.63, with 1,400 stock units changing hands. Stocks trading with no price change| Angostura Holdings ended market activity at $15.70, with 311 stock units changing hands, Guardian Holdings completed trading at $16.65, with an exchange of 1,000 units, JMMB Group concluded trading at $1.64, after exchanging 114,933 shares, Scotiabank closed trading with 12,756 units at $64.50 and Unilever Caribbean ended at $24, with 100 stock units changing hands.